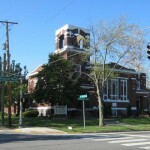 In the heart of Fort Wayne, Indiana, First Missionary Church has enjoyed a rich heritage of ministry and mission for over 100 years. We are part of the Missionary Church, Inc, one of the fastest growing evangelical denominations in America. Our purpose centers in the person and work of Jesus Christ. We “gather” in order to “scatter,” which is the heart of the Great Commission. On Sunday mornings we gather in order to KNOW Jesus and each other, to GROW in our relationship with Jesus, and to be equipped so we can GO tell others about Jesus. We have a strong emphasis on small groups, where people gather regularly in groups of six to twelve for sharing, caring, accountability, and study.